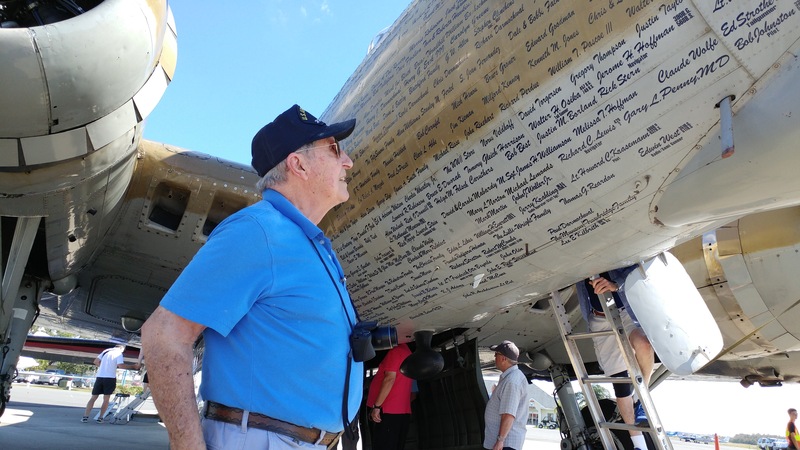 The first weekend in November, the Collings Foundation brought their WWII aircraft to Leesburg, Florida. 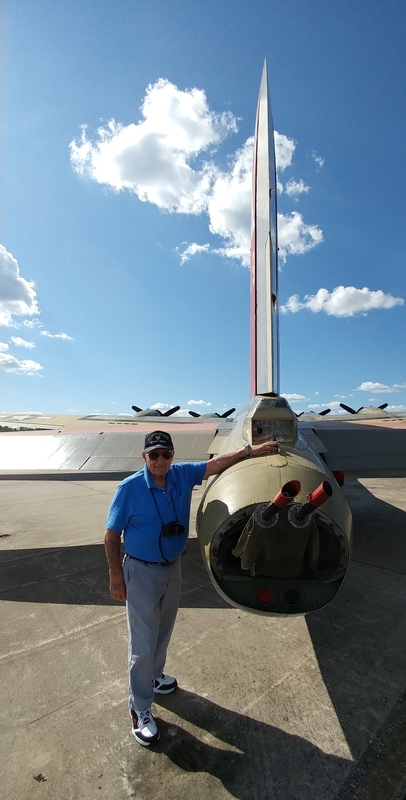 My 384th Bomb Group pilot friend, John DeFrancesco, and I drove down from Ocala on Saturday to see the planes, especially the B-17G. It was a beautiful Florida Fall day to be at the Leesburg airport checking out the planes. The Collings Foundation’s B-17G was the same model my dad and John flew in WWII. 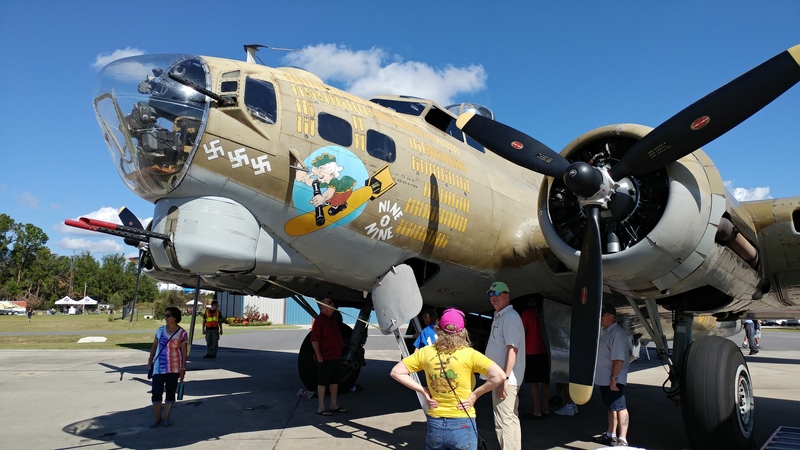 The Boeing B-17G Flying Fortress Nine-O-Nine and Consolidated B-24J Liberator Witchcraft were both open for walk-through tours and the North American TP-51C Mustang Toulouse Nuts was also on display. Rides were available, for a price, on all three. John and I first checked out the Nine-O-Nine, getting a good look at the Flying Fortress up close. 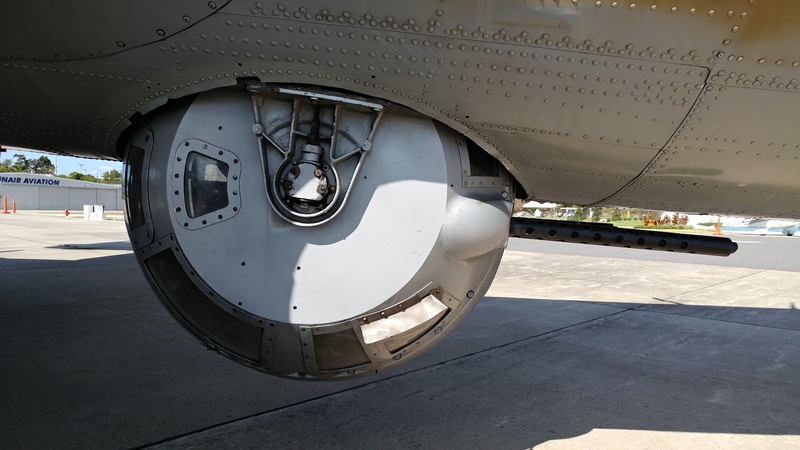 …and from the ball turret to the tail. Then I just had to have a look inside. I have probably walked through the Nine-O-Nine close to fifty times, but I never get tired of exploring this plane that was such an important part of my dad’s history. 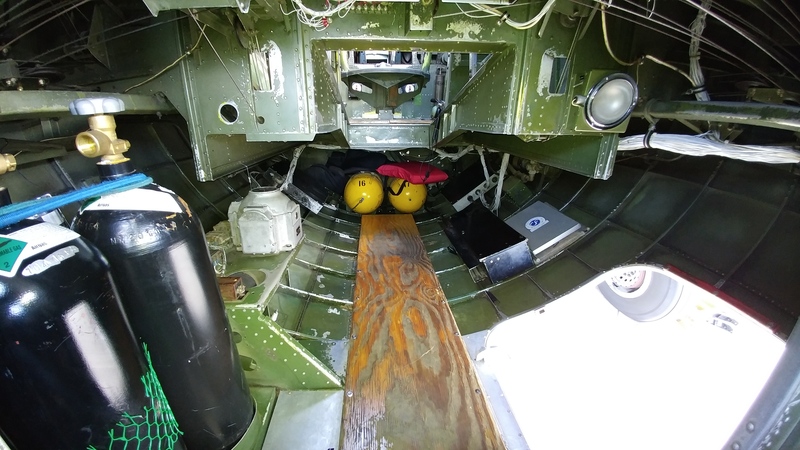 After entering through the nose hatch, I got a good look inside the nose with the Bombardier’s seat and bombsight and the Navigator’s desk. 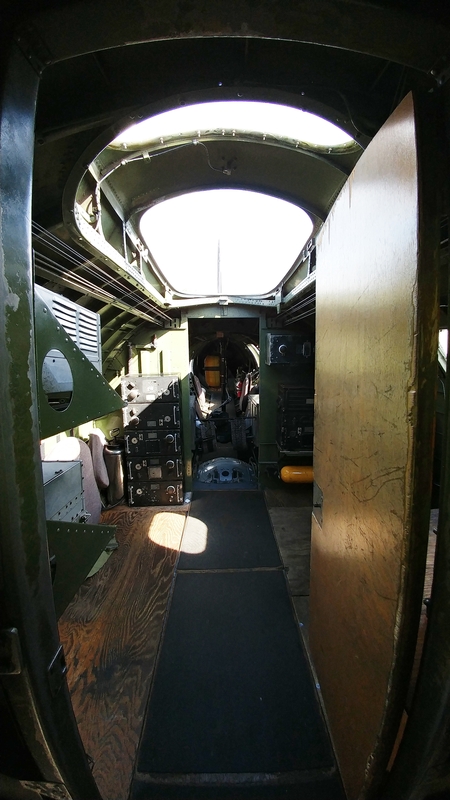 …and took a look at the Pilot’s and Co-pilot’s seats and instruments. The Pilot, like John, would have been seated on the left with the Co-pilot on the right. 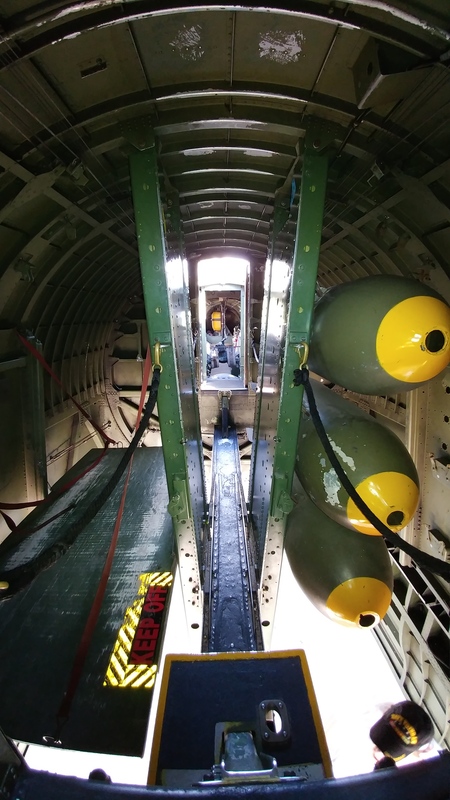 …and then crossed the catwalk through the bomb bay. On the other side of the bomb bay, I entered the radio room. 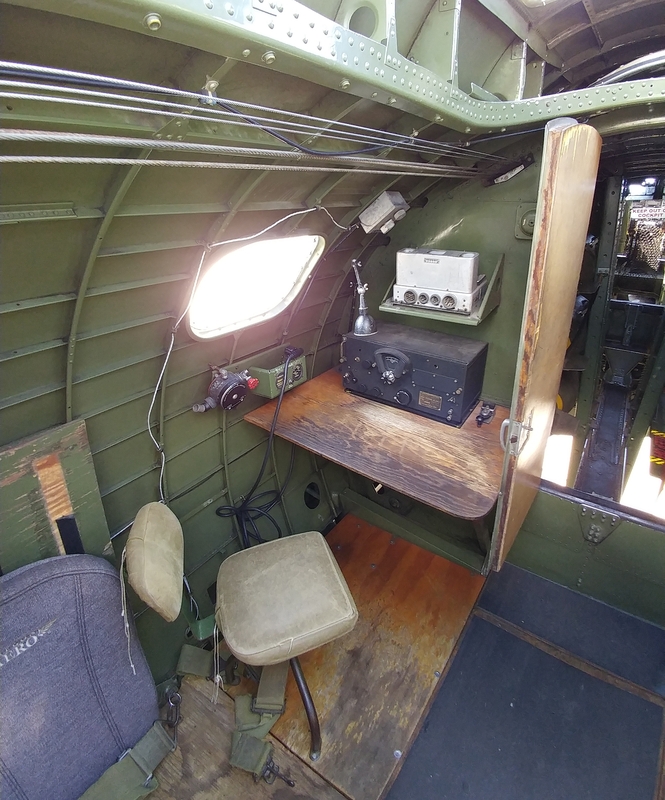 Entering the room, the Radio Operator’s desk is on the left side of the plane, but the entire radio room is filled with his equipment. …and just past the ball turret lies the waist area with waist windows and mounted machine guns on each side. I always picture my dad standing at his position as the Right Waist Gunner. 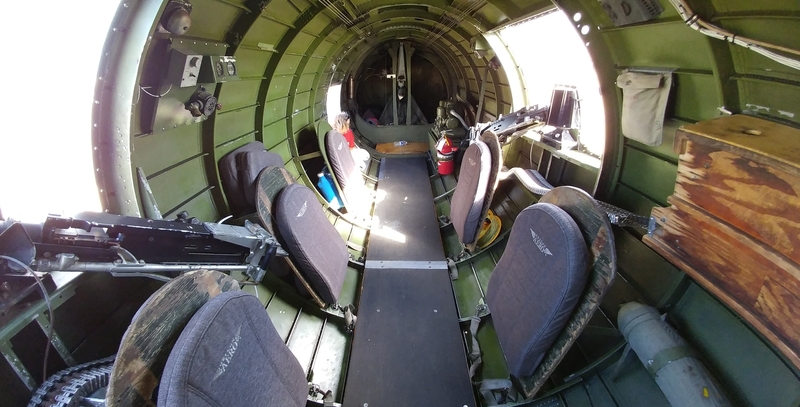 Early in the war, a Left Waist Gunner would have stood at the left waist window, but later in the war, the Radio Operator manned the left waist gun. 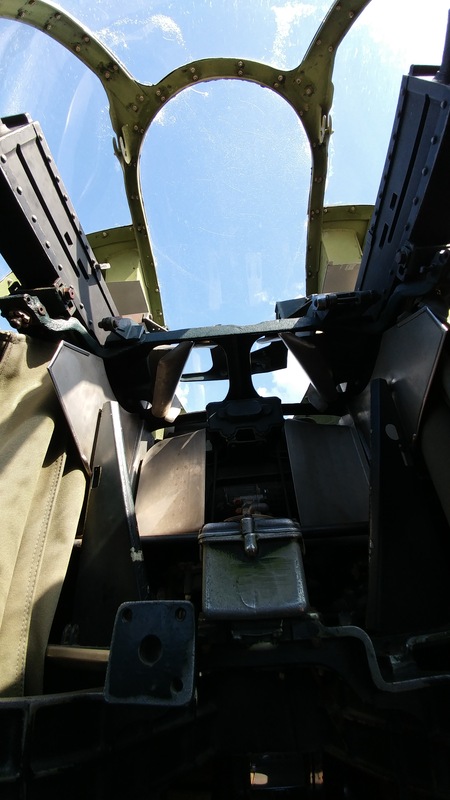 At the rear of the waist area is the tail gunner’s position. Sitting across the tarmac was the B-24 Witchcraft. I have walked through Witchcraft many times, but this day I missed the walk-through tour. John and I checked out the P-51 Mustang, Toulouse Nuts, too. After a couple of hours admiring the planes and talking to several other visitors to the Collings tour, it was time for the Nine-O-Nine’s last flight before leaving for the tour’s next stop. I was lucky enough to take a flight a couple of years ago, so this time I kept my feet on the ground and recorded videos. John, however, was getting a ride on the Nine-O-Nine and took to the skies with Leesburg’s last group of the day. William “Bill” Campbell wanted to fly the B-17 to honor a friend’s dad who was a gunner on a B-17 crew in WWII and to get a taste of what it was like to fly on one. But Bill had also wanted to fly a P-51 Mustang since the late 1950’s, when he attended air-sea rescue training with the West Virginia Air National Guard at Kanawha Airport (now Yeager Airport). There were P-51’s in the same squadron while he was there, but they were being phased out, and he never had the opportunity to take one up. So earlier this day, before Bill had his flight in the B-17, he was strapped into the Mustang for a half hour of flight training. Bill, an experienced pilot, had the time of his life performing loops, rolls, inverted flight, and other aerobatics in the WWII fighter plane. A P-51 and a B-17 flight the same day? I guess it just doesn’t get any better than that. John DeFrancesco was a B-17 pilot in the 384th Bomb Group of the 8th Air Force and was stationed at Grafton Underwood, England during WWII. John finished his thirty-five required missions with a bail out over Germany on January 8, 1945. After his POW liberation and the end of WWII, John remained in the Air Force Active Reserves until the late 1960’s when he went into the Inactive Reserves. In 1984, John retired from the Air Force as a Lieutenant Colonel. You can read more about John here. Robert B. Arserio, a retired Air Force Captain, heard many stories of the WWII bombers when he was stationed with the US Air Force at RAF Upper Heyford in England in the mid-1970’s. His father served in the US Army in WWII and was in the first occupational forces in Japan stationed in Yokohama. 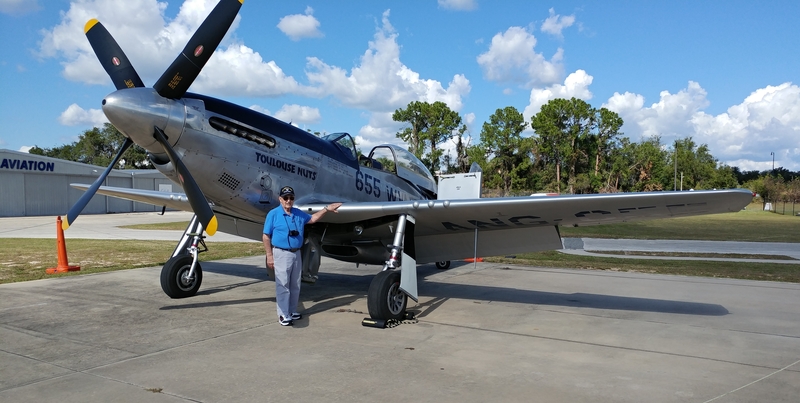 Robert sees the Warbirds almost yearly on their Florida tour and first flew on the Nine-O-Nine with his son twenty years ago in Boca Raton. Oscar I. 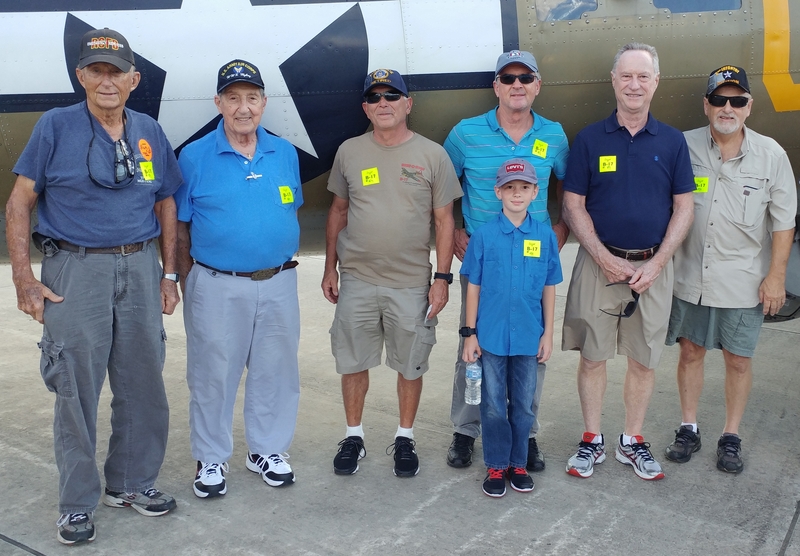 “Chip” Chenoweth brought his grandson Levi Barnes out to see the Warbirds and take a ride on the B-17. Both of Chip’s parents were pilots. His father was a navy ace who flew in the Aleutians at the battle of Attu with the VC-21 and then transferred to the VF-17 (known as Blackburn’s Irregulars) in the south Pacific. Chip’s mother was Miss Miami Aviation at the 1939 World’s Fair. Chip’s mother and father went out on their first date December 6, 1941, the day before the Japanese attack on Pearl Harbor. Levi took his first-ever flight in a Skylane 172 in October and eleven days later he took his second flight on the Nine-O-Nine with his great-grandfather’s squadron patch in his shirt pocket. I know his great-grandparents would have been proud. 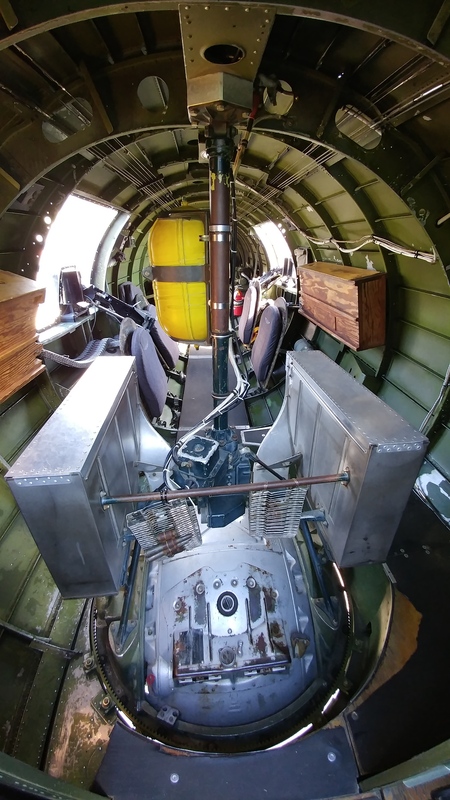 John Marteeny wanted to take a ride on the Flying Fortress because his father, Donald Marteeny, was an Armorer in a B-17 bomb group, the 97th, in England, North Africa, and Italy from 1942 to 1944 during WWII. The 97th Bomb Group flew the Eighth Air Force’s first heavy bomber mission from Grafton Underwood, England when they bombed a marshalling yard at Rouen on August 17, 1942. In September 1942, the 97th Bomb Group was reassigned to the Twelfth Air Force and left England for the Mediterranean theater, and later was assigned to the Fifteenth Air Force in Italy. After the 97th Bomb Group moved out of Grafton Underwood, the 384th Bomb Group moved in. Grafton Underwood is the same base from which John DeFrancesco and my dad, George Edwin Farrar, flew their missions with the 384th. 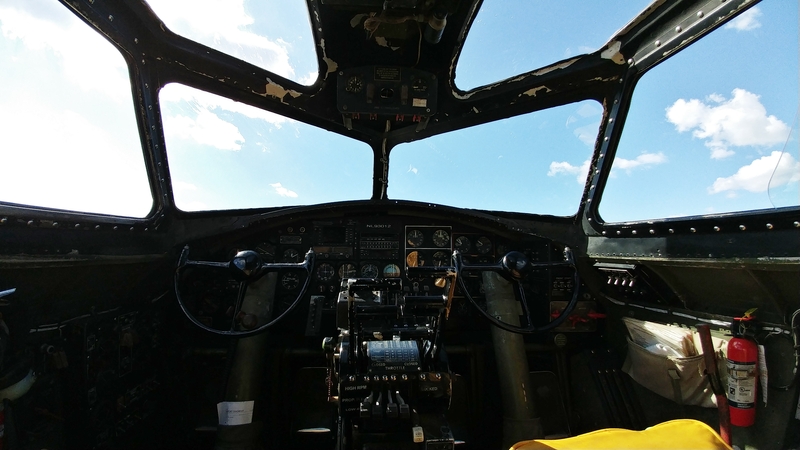 Sonny Rohm has loved the B-17 since he was twelve and at sixty-nine decided it was time to take a ride on one. He also wanted to pay tribute to the brave men who flew them into battle during WWII and to the WWII Women Air Force Service Pilots (WASPs) who ferried new planes from factories to military bases, tested newly overhauled planes, and towed targets for gunnery practice (with live ammunition). We would all like to thank you, Collings Foundation, for bringing your Warbirds to Central Florida. And we’d like to offer a special thanks for a truly memorable flight aboard the Nine-O-Nine to Tour Flight Coordinator Jamie Mitchell and Crew Chief André . We all had an exceptional day and we can’t wait till next year! 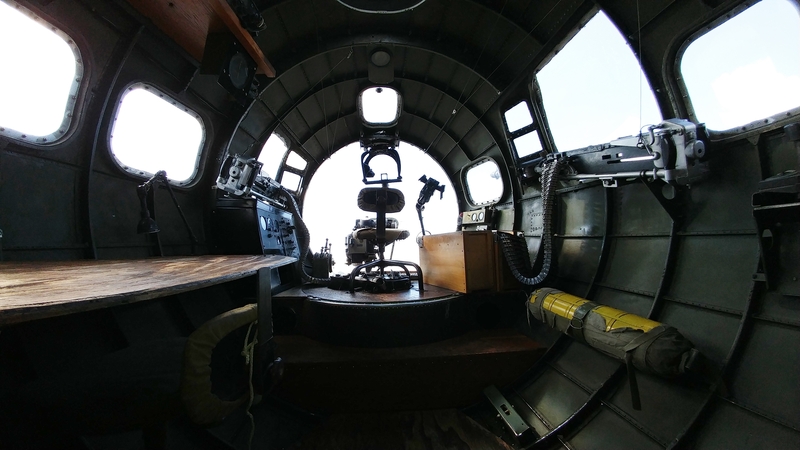 By thearrowheadclub in B-17 Tour on November 15, 2017 .